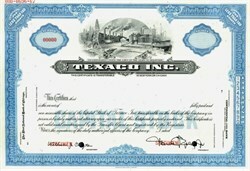 Beautifully engraved certificate from the Texaco Oil Company issued from 1974 - 1978. This historic document was printed by the American Banknote Company and has an ornate border around it with a vignette of oil derricks, factories, and a seaport with a ship next to the dock. This item has the printed signatures of the Company�s President and Secretary. 1901 � Joseph S. "Buckskin Joe" Cullinan and Arnold Schlaet found The Texas Fuel Company. 1902 � The Texas Fuel Company opens its first office in Beaumont, Texas. 1902 � As a result of The Texas Fuel Company's need for greater capital to increase operations, Cullinan and Schlaet found The Texas Company, officially located in Corsicana, Texas. A month later, The Texas Company absorbs The Texas Fuel Company and inherits the latter's office in Beaumont, Texas. 1903 � The Texas Company's third oil well drilled at Sour Lake, Texas, comes in as a gusher, saving the company from bankruptcy. 1911 � The Texas Company opens its first filling station in Brooklyn, New York, and introduces Texaco Auto Gasoline. 1912 � The Texas Company introduces Texaco Motor Oil. 1931 � Through the acquisition of Indian Refining Company, The Texas Company gains the rights to the Havoline brand name. 1932 � The Texas Company replaces Texaco New and Better Gasoline with Texaco Fire Chief Gasoline, which has an octane rating higher than government standards for fire engines. 1936 � The Texas Company and Standard Oil Company of California (later Chevron) form the California Texas Oil Company, Limited (later Caltex) to unite The Texas Company's extensive eastern hemisphere marketing network with Standard's production operations in the Middle East. 1959 � The Texas Company officially changes its corporate name to Texaco Inc.
1984 � Texaco purchases Getty Oil Company, acquiring 1.9 billion barrels of proven crude oil reserves and natural gas liquids. 2000 � Chevron Corporation and Texaco Inc. announce a merger that will create ChevronTexaco Corporation. 2001 � Chevron Corp. and Texaco Inc. complete their merger following stockholder approvals of both companies. ChevronTexaco enters the global marketplace as the second-largest U.S.-based energy company and the fifth largest in the world.